CNN's Don Riddell with the signed flag that will be auctioned to help those in Haiti. 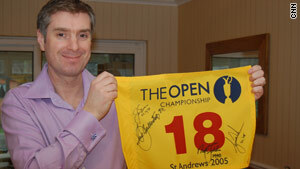 (CNN) -- The sale of Don Riddell's Living Golf flag has now been completed. The auction raised $4,839 for the relief fund in Haiti. I think it's fair to say that most of us have been absolutely horrified by the plight of tens of thousands of Haitians this month. A massive earthquake is always devastating, but for such carnage and misery to be wrought upon a people who already had nothing seems especially cruel. It was 0100 GMT when I went on air, the aftershocks were both frequent and significant, and from the Tweets I read there was a sense of utter panic and fear on the streets. The pictures have been absolutely heartbreaking, and the stories our crews have reported from all over the country have been terribly moving. I wanted to do something to help. For some reason I was especially moved when Anderson Cooper dragged that bleeding boy out of the street - a young boy who was stunned and panicked and terribly vulnerable - and I realized that I had something I could contribute. Years ago, when I was the Living Golf anchor, I was looking to collect something unusual for a charity auction. As it happens, the auction was cancelled and since then I had largely forgotten that I had something of value and unique at the back of my wardrobe. The British Open, one of golf's most illustrious competitions, is never more special than when held at St Andrews, the so-called "home of golf." Every professional wants to be "Open Champion" and of the last seven tournaments to be played up there, many of the champions have been legends of the sport. Jack Nicklaus won it twice, as did Tiger Woods. Seve Ballesteros and Nick Faldo complete the roll-call of champions who have already made it into the pantheon of greats. It struck me that to get all four to autograph a replica flag from the 2005 Open would be pretty special. Seve (1984 winner) obliged me in Tenerife later that year, with a signature as flamboyant as many of his shots. Tiger (2000 and 2005 winner) added his name when we met in Dubai the next year. Faldo (1990 winner) and I live in the same town but our paths never seemed to cross when they needed to and so I posted the flag to his management company and from somewhere on his global travels he obliged. My colleague Justin Armsden interviewed Nicklaus (1970 and 1978 winner) at The Old Course and, though Jack hadn't bargained on signing any autographs that day, Justin's producer Andrea Mortensen bagged the all important tag. So, just to recap, some of the greatest names in golf have signed this unique memento. Also up for auction are the Xeroxed scorecards of all four players when they last all played the St Andrews Open in 2000. They are perfectly reproduced. You'll see Tiger's winning round, counter-signed by another Open Champion David Duval and another card is counter-signed by a man who wasn't yet a major winner, Angel Cabrera. You'll note the meticulous nature of Faldo's game, every hole is neatly ticked off and appropriately, there's even a squiggle and a correction on the card of American John Daly, the only Open champion at St Andrews since 1970 that I was unable to persuade to sign the flag. But maybe his autograph absence and messy scorecard are in keeping with the erratic character we have come to know and love! This year just so happens to be the 150th anniversary of The Open at St Andrews and so it's appropriate to auction the flag and the cards in 2010. But Haiti is the true motivation for the sale. It is right because they desperately need help. All proceeds of the sale will go to a charity called Plan International, who have been working in Haiti for over thirty years. The donation will support their emergency relief and recovery work there with children and their communities; helping the most vulnerable and the very people who are the country's future.